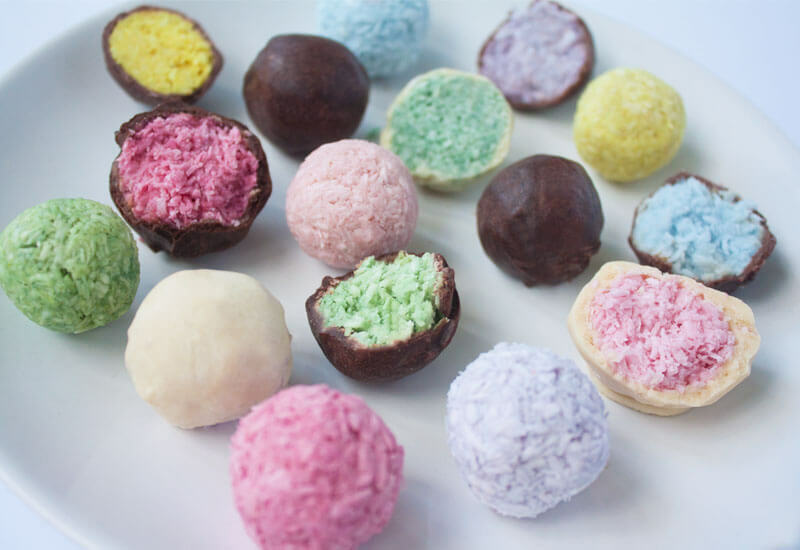 Pastel bounty balls dipped in rich, homemade chocolate with a delicious unicorn colored coconut filling! They are sweet, coconutty with a hint of fruit and a crunchy layer of dark or white chocolate made from raw cacao butter. I don’t know about you, but colorful food makes me so happy, especially in these dreamy fairytale colors. They are not only pretty, but the colors are 100% natural from fruit juice, spices and butterfly pea tea! 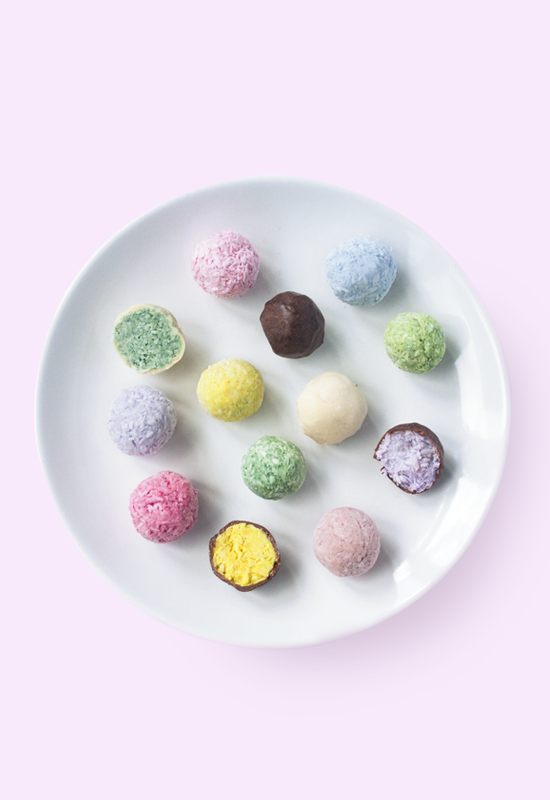 These pastel bounty balls are a remix of the original coconut fruit bliss balls. This time with more colors and coated with two types of chocolate. They are refined-sugar free, dairy-free and vegan. 1. Mix all the ingredients for the coconut filling in a food processor. Divide them into separate bowls and mix in the natural food coloring. You need 1 tsp – 1 tbsp fruit juice depending on the color intensity you want and about a quarter of that of the turmeric and spirulina as they are very strong. Use your hands to make the balls and put them in the freezer to set for about an hour. 2. Slowly melt the cacao butter au bain marie over low heat. 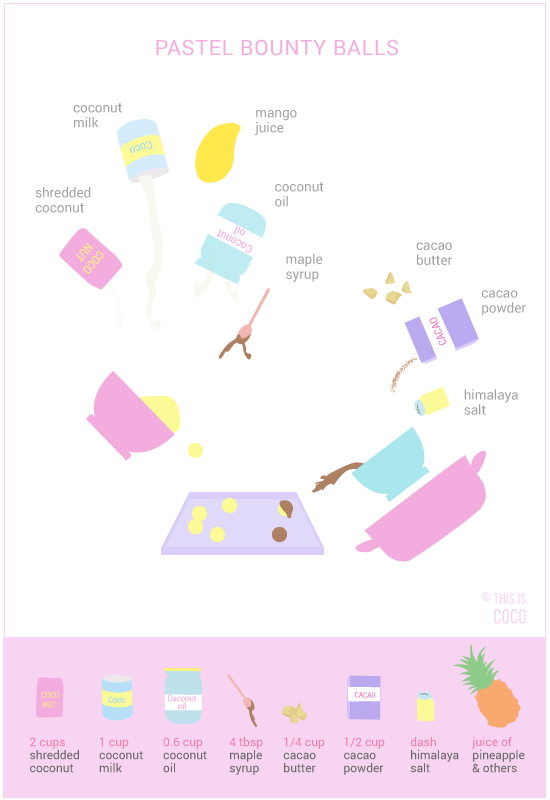 Mix in the rest of the ingredients for the mylk chocolate coating. Do the same in a different bowl for the white chocolate coating. 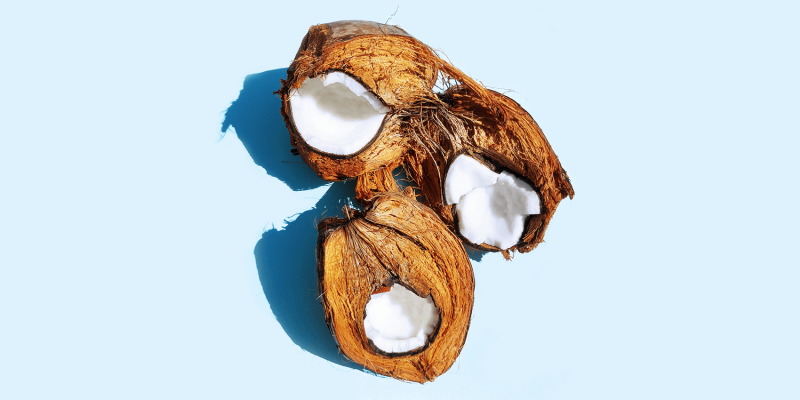 This mix will cool off faster because of the coconut milk. You can slow down the cooling process a bit by using room temperature coconut milk instead of chilled coconut milk. 3. Dip the coconut balls into the chocolate coating. Put them in the fridge to set, then dip a second time and store in the fridge for at least half an hour.